(CNN) -- An extradition hearing is expected in Spain this week for one of two pilots arrested recently on charges they participated in "death flights" in which more than 1,000 prisoners were thrown out of planes during Argentina's "dirty war" in the 1970s and 1980s, officials said. 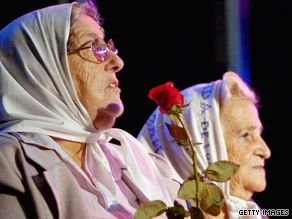 Hebe de Bonafini, left, and members of Madres de Plaza de Mayo hold a demonstration in 2006. Former Navy Lt. Julio Alberto Poch, who has been held in Spain without bail since his arrest in Valencia in late September, will have a hearing before a high court in Madrid, a judge in Valencia ruled. An Argentine judge has asked that Poch be sent back to face long-standing charges from the 1976-83 right-wing dictatorship. In Argentina, police arrested former Navy Capt. Emir Sisul Hess last week in the town of Bariloche, near the border with Chile. An initial hearing for Sisul Hess was held Friday, federal court official Cecilia Brizzio told CNN. Poch and Sisul Hess are accused of piloting aircraft from which drugged and blindfolded prisoners were hurled to their deaths in the Atlantic Ocean or the Rio Plata. The prisoners included students, labor leaders, intellectuals and leftists who had run afoul of the dictatorship because of their political views. Most were dragged off the street or otherwise summarily arrested and held without trial in secret prisons where many were tortured. Sisul Hess, accused in more than 900 deaths, has denied the allegations, said Argentina's government-run Telam news agency. According to Telam, both men were arrested after they told colleagues or friends about their alleged involvement. Up to 30,000 people disappeared or were held in secret jails and torture centers during the dictatorship. Argentine human rights activist Hebe de Bonafini, who lost two sons and a daughter-in-law in the "dirty war," said Monday she found no joy in the arrests. "You can never take back the horror," she said. "In no way am I happy." Bonafini is president of the Association of the Mothers of the Plaza de Mayo, a group of mothers whose children disappeared during the war. She urged the government to continue looking for war crime suspects. Speaking of the pilots, she said, "There are several. They are not the only ones." Poch, a commercial pilot for the Dutch airline Transavia.com, was arrested September 23 when his flight made a stopover in Valencia, Telam said. He was wanted on an international arrest warrant. Poch had been a navy pilot from 1976 until late 1980, Telam said. Upon leaving the navy, he moved to Holland and had been living there ever since. Argentine federal Judge Sergio Gabriel Torres is pursuing the extradition of Poch and handling the arrest of Sisul Hess. Torres traveled to Holland to question Poch's colleagues and others, Telam said. An aviator told Torres that Poch had said at a restaurant in Indonesia in December 2003 that there were occasions in which people were thrown out of helicopters and airplanes because the armed forces were dealing with "terrorists," Telam said. The aviator, identified as Tim Eisso Weert, told the judge that Poch said it was a humane way to execute people because they were drugged, the government news agency reported. A co-pilot told the judge that Poch had said they "should have killed all" the subversives, Telam reported, and that he admitted "some responsibility" because "when you fly persons on board the responsibility lies with the pilot." Sisul Hess is similarly said to have implicated himself, telling friends that the prisoners "did not suffer because they were drugged, falling like little ants," Telam said. Sisul Hess served as a helicopter pilot in 1976-77 and retired as a captain in 1991, the news agency said. He was arrested September 29 and transferred to Buenos Aires, Argentina's capital. Judge Torres was not available Monday to take three phone calls from CNN, aides said. Nor were any documents on the cases available, the aides said.